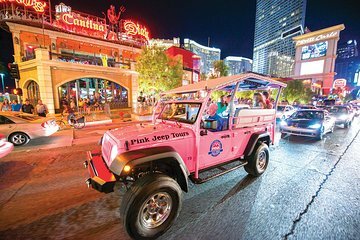 Besuchen Sie Las Vegas in einem pinkfarbenen Jeep während dieser 3,5-stündigen Sightseeing-Tour. Hören Sie, wie Ihr Guide Ihnen berühmte Sehenswürdigkeiten wie die berühmte Springbrunnen-Show von Bellagio, die angesagte Fremont Street und Drehorte für die beliebte Fernsehsendung "Pawn Stars" zeigt. Erleben Sie durch seine funkelnden Lichter und nächtlichen Aktivitäten eine andere Perspektive auf Sin City. Der Hin- und Rücktransfer von Las Vegas Hotels ist inbegriffen. Wenn der pinkfarbene Open-Air-Jeep zu Ihrer Hoteltür fährt, steigen Sie ein und machen Sie sich auf den Weg. Vergessen Sie nicht Ihre Kamera für eine Fülle von Fotomotive, die diese Tour bietet. Ihr erster Stopp ist das berühmte "Welcome to Fabulous Las Vegas" -Schild. Nehmen Sie sich an diesem Wahrzeichen ein paar freche Fotos vor, und fahren Sie dann weiter zum Gold & Silver Pawn Shop, dem Drehort der beliebten Pawn Stars-Show des History Channels. Begeben Sie sich auf den Strip, die unvergleichliche Hauptstadt des Glitzers und Glücksspiels im Herzen der Wüste. Fahren Sie an Luxushotels und Casinos vorbei, die Nachtlichter an jedem Ort versuchen, den Rest zu übertreffen. Ihr Fahrer hat einen Einblick in die neuen Gebäude, wer besitzt sie und wie viel sie kosten. Genießen Sie im Fremont Street Experience 5 Stadtblöcke mit digitalen Überdachungen, die enorme Animationen und synchronisierte Musik zeigen. Sehen Sie sich eine Lichtshow auf dem weltgrößten Videobildschirm mit über 12 Millionen LED-Lampen an. In diesem Bereich finden zahlreiche Aktivitäten und Unterhaltung statt. Sie können Ihr Abenteuer wählen. Der letzte Halt des Abends ist die berühmte Springbrunnen-Show im Hotel Bellagio. Nach Ihrer umfassenden Tour durch Vegas bei Nacht können Sie in Ihrem Hotel wieder absteigen. Enjoyed it. Guide was very helpful and knowledgeable and friendly. Took us to good places and was always willing to help with photos. A good way to see the strip and surrounding areas. We booked this as a way to help us familiarise ourselves with the strip. It was a really good idea and was also a good way to get our photo taken at the famous Vegas Sign, our tour guide kindly took the photos for us. We also visited the Pawn Stars shop and the Freemont area, where we had a good look around and went into the Golden Nugget Casino. Would definitely recommend this as a good thing to do after first arriving in Vegas a good way to get your bearings. Only thing i would change is the driver to wear a mic as it was difficult to hear what he was saying when travelling along the trip with the wind and the traffic. Tim Ely was amazing! Very knowledgeable about the history of Vegas! Great tour and would recommend to others! Chris our driver was fantastic. This was so much fun. Great to have someone look after you and take you to some of the night highlights in Vegas. the driver did not tell us anything about vegas ! this was waste of money ! we prefer the big bus tour ! What a trip, the driver had so much knowledge and took us to places of interest. I really liked the stop off at Freemont Street.  Our driver was on time, extremely friendly and knowledgeable about the area. He had lived in the area his entire life and had many stories and facts to share about Vegas through the years. I would highly recommend this tour. A definite thumbs up. Fantastic tour - was so much fun - got to see lots of sites around Las Vegas and plenty of time at Fremont street for looking around. Highly recommended tour. The tour was amazing, our guide Tim was very knowledgeable. We learnt so much about Vegas and had lots of fun.